Have you ever stayed at a hotel and had the best sleep of your life? I’ve had a few of those stays where I literally want to pack that cozy room up and take it home with me. Well, why not create a cozy retreat at home in your bedroom using some principals used by some of the top hotels around the world. Today I’ll share 7 ways to create the coziest of bedrooms that you’ll never want to leave. When we stayed at the Mirbeau Inn in Plymouth, Massachusetts a few years ago, I loved the bed we slept in so much I ripped the bedding off to see what kind of sheets and mattress they had. Come to find out, they actually sell their comfy mattress. But, if you don’t have the money or the need to buy a brand new mattress, a quick upgrade in bedding could create the cozy sleep space you crave. Just recently we received the most comfortable bamboo sheets from our friends at Cariloha. Our new resort-style bed sheets are so incredibly soft and luxurious, I can’t imagine sleeping on anything else. They arrived in a gorgeous box that included washing and care instructions, and they were wrapped carefully in a matching bag and Cariloha ribbon. They washed up beautifully and look amazing on bed. They keep us both cool at night, even when we’re under our heavy feather duvet. I don’t wake up in the middle of the night anymore sweating to death! Amen to that! Add some comfy pillows and a throw blanket to your bed, along with some fancy bamboo sheets and a fluffy duvet, and you’ve got a cloud to call home when you’re ready for rest after a long day. Another thing I’ve noticed in some of our favorite hotel rooms, is that they all have cozy, soft, romantic lighting. Nothing sets the mood for relaxation more than soft lighting from lamps or candles. I especially love our lava salt lamp that gives our bedroom a cozy glow. Of course, our favorite hotel rooms are always minimalistic in style and decluttered. But, obviously we have to actually live in our bedrooms, right? So, keep the clutter to a minimum. Do a deep clean and organization of your bedroom a couple times a year to ensure it remains a relaxing environment. Donate those clothes you don’t wear anymore. Donate the books that are piling up in the corner. Clear that clutter and only bring in things that you absolutely need and/or love. I think it’s just lovely when a bedroom includes a comfy sitting space for reading or enjoying the morning cup of joe. Mix and match colors and textures with pillows and throws and make this space in your bedroom extra special. Perhaps, you could include a side table for a candle and a floor lamp to offer some soft lighting. Most of our favorite hotel rooms had a sitting space in them, and I want to recreate that in our room at home too. For my 30th birthday, Adam surprised me with a trip to Chicago and he booked a fancy hotel room at the Ritz Carlton. We felt like royalty! I loved everything about that hotel room including the corner bath with a soaker tub overlooking the city skyline, Lake Michigan, and Navy Pier. The walls were papered with the softest hue of blueish gray and the linens on the bed were white and cream. Everything about that hotel room was peaceful. I wanted to create that same tranquil feel in our bedroom at home. 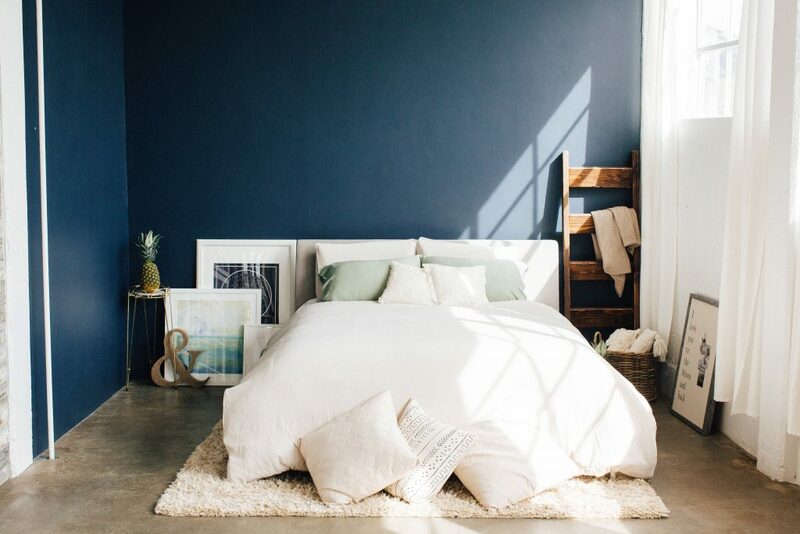 We painted our walls a soothing blue and dressed our bed with piles of cozy white linen. When decorating your cozy space, choose soft, inviting pain colors that are relaxing and soothing. Choose simple patterns for your bedding and colors that you love. Add meaningful photos in frames and special artwork in your bedroom to add some personality to your space. Keep your art soothing and inspiring. You may have heard of Marie Kondo by now. She has a new series on Netflix all about tidying up that based on her award winning book. One thing she teaches is to surround yourself with things you love. Let items serve their purpose and then either donate them or get rid of them, and only keep those things that bring joy. Keep your bedroom simple with only a few items that bring you joy. It could be your favorite candle, a blanket, a picture, or a handwritten letter. Don’t allow your room to become a drop zone for all the things. Work at creating your own cozy nest one step at a time, and you’ll be able to enjoy your own relaxing retreat any time you want without ever having to leave home. Read more from Lattes, Lilacs and Lullabies here.